The pride of Dave Hollen's collector car fleet is also the car that almost got away. Actually, it did get away for a while, but even though he didn't actually own his 1954 Kaiser Manhattan for the first 46 years of its life, Hollen always felt like the car was his. 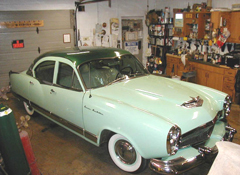 "Well, my uncle Clair ran a Kaiser dealership years ago, and we were very close," said Hollen, a resident of Glasgow, Pa. "From the time I first saw the car in April of 1954, the thing just kind of stuck on me. I remember when we went out that day to get the cars and went to the railroad yard. I thought to myself, 'My god, that is one beautiful automobile.'" Click here to find out how Dave finally wound up with his beloved Kaiser.